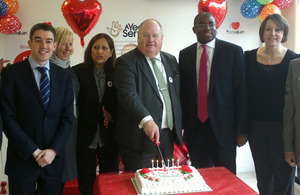 Communities Secretary Eric Pickles visits Tottenham, an area badly affected by the riots. The minister met local traders and members of the community to hear first hand the progress they have made to get their area back on track. Joined by Haringey Council leader Claire Kober and local MP David Lammy, Mr Pickles also toured the high street to see how the community is using the support available and their ‘I love Tottenham’ campaign to help get businesses back on their feet. The blaze at the town’s Carpet Right store became a key image of the summer disturbances and the Secretary of State was shown the progress underway to repair the building. To mark 6 months on Mr. Pickles also popped into the local post office, relocated to a new building in the aftermath of the riots, to see how it has remained a focal point of community life and where residents can get on with their day-to-day business. “The most powerful enduring image of the disturbances is not of the minority of rioters but the majority of local people and local businesses that all came together in Tottenham with Haringey Council to rebuild their communities. In the immediate aftermath of the riots the government made available a mulit-million pound package of support to enable councils to act swiftly and confidently to restore communities and get support to local people and businesses. In August 2011 the Communities Secretary announced, a £20 million enterprise and growth package for Tottenham and Croydon to kick start economic regeneration, support business, deliver new job opportunities and promote their future prosperity.